The days of the full-service gas station are gone, and modern cars can go 30,000 miles or more without a tune-up. So it's up to YOU to check the little things before they become big, expensive problems by checking under the hood of your Mercedes on a regular basis. An old-fashioned maintenance term that's nearly non-existent today. With electronic ignition and fuel injection came computers that took over control of engine settings. Early versions allowed for some tinkering, but today's engines require advanced equipment and training. Oil pressure - or more precisely the lack of it - in certain parts of your Mercedes' engine can become a major repair nightmare. All engines lose a certain amount of oil pressure over time as normal wear increases bearing clearances. But unusually low oil pressure in an engine, regardless of mileage, is often an indication that something is seriously wrong and requires immediate repairs. That "tappet" noise may be only one sticking lifter but it may also indicate an oil flow problem that will eventually cause damage to at least one valve. 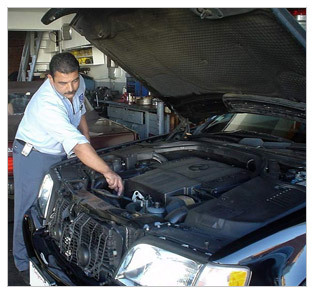 The following diagnostic tips (excerpted from "Troubleshooting Low Oil Pressure", Underhood Service, 10/97) will help you determine whether you have a major repair problem or just a minor annoyance. Your brakes keep your family safe. Mercedes brake parts and repairs - expensive? Yes! Mercedes brake rotors, unlike domestics, are built with minimal thicknesses to save weight - meaning they can't be "turned"; they must be replaced. Bring it in to Malubu Motors and let us take a look at it. We have the Certified Master Mechanics to make sure your Mercedes Benz is running in tip-top condition. 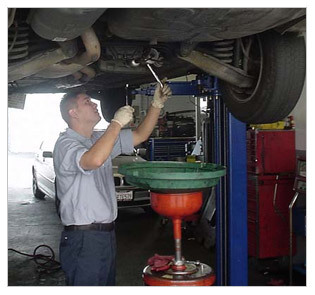 Mercedes Brake Drums (if equipped) should also be inspected on a regular basis. Check for the same types of flaws as noted above. The drums should not have excessive grooves or have a deep "trough" dug into them where the shoes ride. Today's auto electrical systems are getting more intricate and are stressing the limits of current technology but they are basically the same design as 30 years ago. What can today's do-it-yourselfer do to keep from being electrically-challenged in the middle of nowhere? A quick overview of your Mercedes' electrical system would be a good start. Bring it in to Malubu Motors and let us take a look at it. We have the Certified Master Mechanics to make sure your Mercedes Benz is running in tip-top condition. 1. Protect your paint from the sun. Ideally, you'll want to keep your new Mercedes car out of the sun as much as possible. This means parking it in a garage. If you can't do that, you'll want to purchase a car cover to protect it from the sun's rays which will stop your paint from fading. Some car covers do more than just protect against weather as well — they even come with light padding that can protect your vehicle from everyday light damage. If a bike tips over or a branch falls down, your Mercedes is safe. 2. Secure your loads well. Even the most meticulous planning can be ruined by an insecure load. If you're hauling things — like bikes on a bike rack — make sure they're secured properly. Even the slightest insecurity will cause whatever you're hauling to move during your trip, scratching and denting your beautiful paint job. 3. Wash in winter as well as summer. Many car owners don't bother to wash their cars in winter. "What's the point?" they ask. What's easily forgotten is that cars aren't just washed for aesthetic reasons. In fact, that's just a side benefit. You wash your car to prevent the damage that can be inflicted by sand, slush, ice and road salt. Over a long winter all of that adds up –and that's exactly what leads to rust and corrosion. Wash your car frequently during the winter, and give the undercarriage a rinse while you're at it. 4. Wax On. Wax Off. Waxing isn't an easy job — in fact, it's really hard work — but it's absolutely necessary if you want to keep your Mercedes looking new. Not only does it make your car shiny and great to look at, it provides a barrier between your paint and bird droppings, tree sap, and various other environmental hazards. 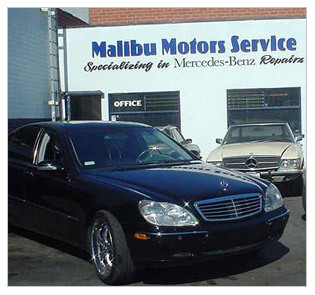 We look forward to serving your Mercede Benz right here in Santa Monica.